Taxi drivers block the road in Whitehall in central London June 11, 2014. While taxi drivers go on strike, Uber has seen an 850 percent increase in sign-ups for the app. Uber sees an 850 percent jump in sign-ups, while cab drivers across Europe protest the taxi-hailing app by going on strike. Experts call the strike against Uber “PR gold” for the app. Taxi-hailing app Uber saw sign-ups jump to record levels on Wednesday, following a rush of publicity as cab drivers across Europe went on strike to protest against the company. Marketing experts described the strike as an “own goal”, after Uber said there had been an 850 percent increase in sign-ups compared to last Wednesday. Uber accused London taxi union, the Licensed Taxi Drivers Association, of being stuck in the “dark ages” and called on the union to cancel the “irresponsible” strike. Andre Spicer, professor of organisational behavior at Cass Business School, described the strike as “PR gold” for Uber. “It’s an own goal. Uber is top of everyone’s minds. Lots of people who have never heard of the app before now know what Uber is,” he told CNBC. He said a company like Uber, which is bringing new technology to the market, faces two main difficulties: visibility and explaining how their technology works. “Journalists – and even the leaders of the protest – are now talking about the app on the news, and explaining how it works. It gives it 1,000 percent more credibility than if the company did it themselves,” he said. In an attempt to placate London’s protesting taxi drivers, Uber has announced plans to open its app based service up to black cabs, adding that it is a “shame to bring London to a standstill”. As well as Uber services, customers will now be able to hail a black cab from the app, which Uber claims is “good for riders, good for London cabbies, and good for the local economy”. 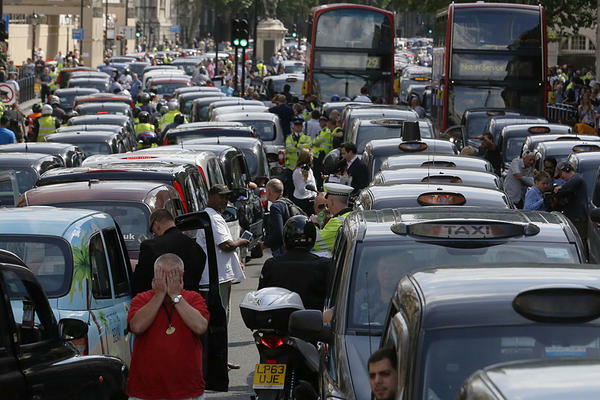 Taxi drivers in London begun their protest Wednesday afternoon, creating gridlock around central tourist hotspots Trafalgar Square, Whitehall and Parliament Square over claims Uber is in breach of taxi meters regulation. Taxi drivers insist that because the Uber system calculates its fare according to distance and time, it is the same as a meter, which only black cabs are regulated to use. London’s transport regulator, Transport for London (TfL), has asked the High Court to give a final decision on whether Uber is breaking the law or not. Black cab driver and representative of trade union Unite, Peter Rose, who is helping to lead protests in London, said Uber’s inclusion black cabs was clearly a “deflection” and doubted there would be any real take-up of the offer. “There is no history of cab drivers using private hire firms. It isn’t about Uber, this is about TfL. TfL should be acting like a proper regulator,” he said. Protests are also underway across Europe, and in Milan, Uber is offering a 20 percent discount on passengers journeys in response to the strikes. Minister of Transport Maurizio Lupi has questioned the legality of the taxi app as only drivers with a license can operate in the country and two Uber cars have already been confiscated by the police this year. Professor Spicer added that there was a long precedent of protests encouraging the opposite behavior. For example, in the 1980s and 1990s there was moral opposition to rap groups including N.W.A. and Public Enemy because of the strong language used on their records. “But this moral crusading gave the bands a certain aura – people thought they sounded cool and wanted to try them out. A similar thing is happening now with Uber. This protest is making it look interesting,” he added. So here’s hoping for Malaysia and Thailand Taxi Drivers will throw a strike too. We are kind of hoping there will be more competition to the Malaysian and Thailand Taxi drivers. They are an entitled bunch who extort from their customers. Of course one of the root cause of the problem. Is the taxi license system. Which rewards rent seeking crony company who don’t really add any major value to the production of service. And yet exort $100+ a day from the cab driver. This makes the taxi drivers have resentments and seek to pass on the same rent seeking attitude to the customer. So why not just quit paying the rent seeking $100 RM a day for the taxi license. Why not just be a verified Uber driver. Or whatever Uber like taxi service. And make a pure profit straightaway on the first customer they take. Competition as they say after all. Is good for the consumer. In this case even the Taxi Driver will benefit. This entry was posted in Technology and tagged automobiles, cab, taxi, transport by MrAdrian. Bookmark the permalink.